Dental crowns are permanent tooth shaped “cap” or coverings (restorations) that are cemented over your existing teeth to permanently change the color, shape, or contour of teeth. Dentists recommend dental crowns in a number of different situations. Below are just a few of the most common reasons why your dentist may recommend you consider having a dental crown. Your tooth does not have enough remaining tooth structure to support a replacement dental filling. Your tooth has had root canal therapy (removal of internal blood supply). Teeth that have had root canal therapy become brittle and prone to fracture. A dental crown protects your tooth from fracture. To correct a problematic space or food trap between two teeth. To permanently change the color, shape, or contour of a tooth. 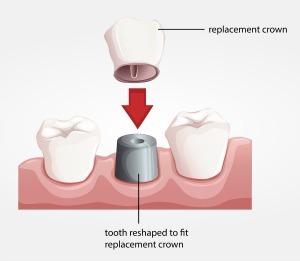 A dental crown is necessary after the placement of a single tooth dental implant. The dental crown procedure is pain free and typically requires two dental appointments. 1st Appointment (90 minutes): dental crown preparation, impressions, and placement of a temporary dental crown. 2nd Appointment (30 minutes): dental crown cementation, try permanent crown in and ensure a custom fit prior to final cementation of permanent dental crown. A digital x ray and photograph of the tooth are taken prior to preparation of tooth. A shade will be chosen that closely matches your existing teeth. A preliminary dental impression is taken and is used to fabricate a custom temporary crown after tooth preparation is complete. This temporary crown will be temporarily cemented in place while the dental lab fabricates your permanent dental crown. Pain free anesthesia is administered. Once your tooth is completely numb feeling, the dentist will prepare your tooth for a dental crown by reducing the size of the tooth to custom fit a permanent dental crown. After tooth is prepared, the dentist will take a series of dental impressions of the tooth and bite. These impressions are then sent to the dental lab and are used to fabricate your permanent dental crown. Finally, your dental assistant will temporarily cement your temporary crown in place, review post appointment instructions, and schedule a future appointment to permanently cement your fabricated dental crown. Dentist will place permanent crown and perform a series of tests to ensure that fabricated dental crown fits your tooth perfectly. Once the dental crown is checked and fits perfectly, the dentist will permanently cement your dental crown in place and will review post appointment instructions. There are many types of dental crowns available. Upon completion of a dental examination, your dentist will identify and discuss your available treatment options so that you can make an informed decision regarding proposed dental treatment. Q. Is the dental crown procedure painful? A. No, the dentist will make sure your tooth is comfortably numb prior to beginning tooth preparation procedures. Additional amenities including nitrous oxide (aka laughing gas) are available. Q. How do you take care of your temporary crown? A. You’ll want to brush and floss as usual. If space between temporary dental crown and adjacent tooth seems tight, then pull floss sideways through the base of the teeth instead of pulling the floss upwards and out. Should you accidentally pull your temporary crown off, just call (763) 586-9988 and we’ll recement your temporary crown. Q. Are there any foods that I should avoid in the interim till my crown is permanently cemented? A. It is best to avoid sticky foods like candy and chewing gum as well as any extra crunchy foods like nuts. Q. Will my tooth be sensitive afterwards? A. It is not uncommon for the tooth to be extreme temperature sensitive initially (2-3 days) following your dental crown appointment. Using a desensitizing toothpaste in the interim can help. Q. What happens if my temporary crown becomes loose? A. Don’t panic. Remove the temporary dental crown to avoid accidentally swallowing it and call us as soon as you can. We’ll temporarily recement your temporary back into place. If you are unable to come in, most drug stores sell temporary dental cement. Just be sure to follow the package instructions. Note: It is very important to have your temporary dental crown in place the entire time while your permanent one is being fabricated. If the temporary crown falls out and is not recemented in a timely fashion, the adjacent teeth will begin to shift and potentially impact the fit of the permanent dental crown. Q. Are dental crowns covered by dental insurance? A. Most comprehensive dental insurance plans provide some level of dental crown coverage. This varies among dental insurance plans. Prior to scheduling your dental crown, one of our patient care coordinators will gladly review your specific dental insurance coverage with you and inform you of any plan deductibles and/or estimated out of pocket expenses. Q. What if I don’t have dental crown coverage? A. Dentistry for the Entire Family offers a cash discount for patients without dental insurance coverage. Need flexible payment options? Click to learn more about available financing options through Care Credit. Q. What is the difference between a dental crown and a cosmetic dental crown? A. Dental crowns can be a great cosmetic option for people who are looking to improve the appearance of a tooth or of several teeth. Cosmetic dental crowns are not typically covered by dental insurance plans. Call (763) 586-9988 to schedule an appointment or click below to request an appointment online.